I'm Dr Golly, welcome to The Art of Patients. When we assess a child’s development we look at four broad areas – which we call domains: gross motor, fine motor, language and social domains. Today we’re talking about normal language development in children and when you might need to have their speech assessed. Although babies begin communicating with us well before they’re born, it’s the development of language that most closely reflects brain growth and the domain most anticipated by parents – because it’s so entertaining! The use of gesture and understanding of non-verbal cues are more closely examined in the social domain of development, so let’s go to the whiteboard and look at what’s normal for language development. There are two parts to language development: expressive language is the ability to talk and receptive language is the ability to understand what another person is saying to you. In order to determine what is normal, we look at thousands and thousands of children with a similar age and background. There will be some super smart children, developing very fast; others who are slower, but the vast majority will sit somewhere in the middle, making up the average – or most common – level of development for that age. If you draw a line over this distribution of children, you get a distinct bell-shape. We then take the middle two-thirds of these children and call them ‘normal’ – this is why we call it the NORMAL distribution or the BELL curve. Anyone less is below-average and anyone above is – you guessed it – above-average. It's important to remember that many things impact on the speed with which a child's language develops. For instance, girls commonly develop faster than boys, bilingual children tend to start slower and then develop quicker after time, and children with medical problems – like lots of ear infections – may have temporarily delayed speech development. So what is normal development of speech? Well, at 6-months a child will usually start to babble, vocalising excitement, pain, pleasure or frustration. They will respond to their name and recognise certain words. They will also focus their eyes on a speaker’s mouth and begin to experiment with their own mouth, changing its shape to produce p, b and m sounds. Interestingly, the babbling that babies make is identical throughout the world, no matter their mother-tongue. This is why almost all languages have similar sounding p, b and m sounds for mum and dad – which are usually a child’s first words; maa-ma baa-ba in Mandarin, ami abi in Arabic, abba ima in Hebrew and maman papa in French! By 12 months, babies will know their own name, listen when spoken to and understand the word ‘no’ in their language. As they develop, their vocabulary grows each and every day. By two years, toddlers should understand the meaning of words like up, down, hot, off and have a vocabulary up to 20 words, which they’re starting to put together in 2-word sentences. They have the capacity to point to named body parts and love getting their tongues around difficult words like kindergarten. From the age of two, we see a massive explosion in children’s language acquisition, learning up to 10 words every day. If your baby isn’t babbling by 12 months or have any words by 18 months, get their hearing checked and have them seen by a doctor. Just remember, a child may have the capacity – yet choose not to talk much, and this shouldn’t be confused with developmental delay. Children always understand more than they can talk! 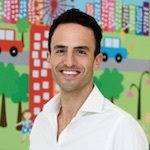 Dr Golly is a Melbourne-based paediatrician specialising in children’s acute and chronic medical conditions, with a particular interest in the newborn period and unsettled babies. View the developmental milestones of a child from birth to 24 months.